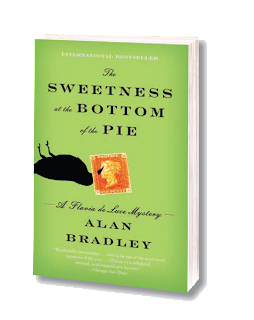 Alan Bradley can be described as a delightful mix of Harriet the Spy and Sherlock Holmes. Though fantastical at times, we found the book well-written, amusing and entertaining with an Average Rating of 4.55 (12 participants). The consensus of our readers leaned toward the incredulity of the aspiring chemist and precocious 11-yr old, lover of horehound candy, rider of Gladys the bicycle, sleuth beyond her years: Flavia de Luce. Her childlike invisibility in relation to her emotionally distracted family proved the playground for her attempts to solve "the mystery". Who murdered the stranger in the cucumber patch outside her bedroom window early one morning? This "far-fetched" tale tactic was an intentional literary detail by the author, Alan Bradley. The uniqueness to Flavia's character had purpose in incorporating endless possibility as well as an intense curious energy. The character, according to Bradley, "walked onto the page of another book he was writing, and simply hijacked the story. She just materialized. I’ve never had a character who came that much to life. I’ve had characters that tend to tell you what to do, but Flavia grabbed the controls on page one. She sprung full-blown with all of her attributes--her passion for poison, her father and his history--all in one package. It surprised me." It both surprised and entertained us as well. We found the book to be filled with delicious descriptions, metaphors, similes and richly round characters. The de Luce family being no exception with the preoccupied & conceited 17-yr old budding musician, Ophelia de Luce, the aloof 13-yr old bibliophile, Daphne de Luce, and the ever-distracted and emotionally absent philatelist and widower, Colonel Haviland de Luce. We became familiar with Harriet, the mother of this dysfunction, through the observations and yearnings of Flavia, who searched unceasingly to find remnants of the past to give meaning to her present and future. 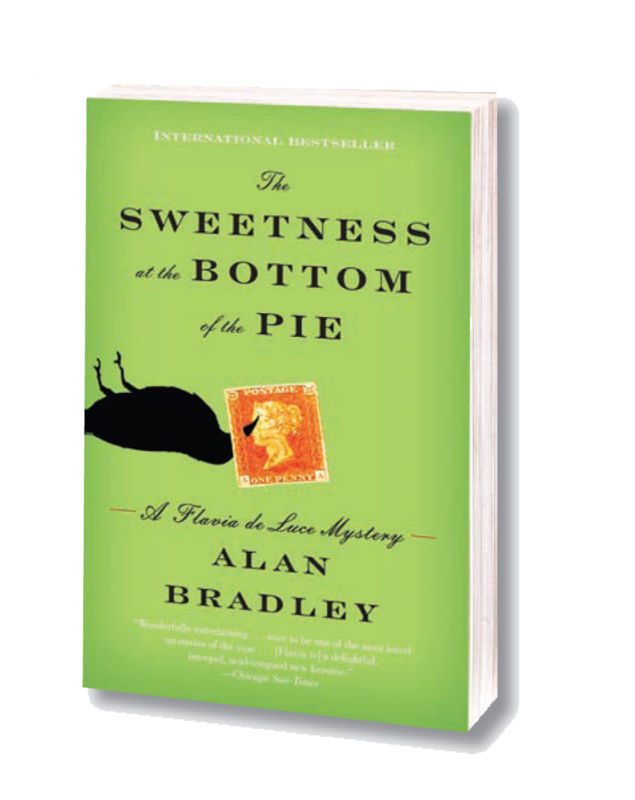 The title of the book was taken from the quote "Unless some sweetness at the bottom lie, who cares for all the crinkling of the pie?" William King, The Art of Cookery (1709). We discussed that although the de Luce family had pretense, they lacked substance. There was no sweetness to their "pie". The relationship between sisters was discussed as combative, cheeky and cunning. Such an eccentric sisterhood truly demonstrated that, "the fiercest competition for survival comes from it's own tribe". This witty and sometimes vicious jocularity between sisters was described by one of Flavia's discoveries that "a substance tends to be dissolved by solvents that are chemically similar to it". Case-in-point; Flavia's mischief with the lipstick was returned with Opheila's affection-disguised vengeance. Surrogate family affection came to Flavia from the most unlikely source- the gardener, jack-of-all-trades, Dogger (Arthur Wellesley Dogger). The relationship of tenderness and real emotion was demonstrated by the confidences held between them, secrets not only about the murder, but about the depth of their relationship. Flavia notes while in the pit, that the only one who would care if she was gone would be Dogger. The climax of the story also details this, "Dogger stood in front of me, his hands hanging down at his sides. If he'd had a hat, he would have been twisting it. We stood there looking at one another.... I turned to Dogger to deliver my soon-to-be-classic remark, but he beat me to it. 'My Miss Flavia, ' he said quietly. 'It's turning out to be a lovely evening, isn't it?'" Another enjoyable aspect of the book was its unexpected twists and turns and loads of tasty period detail. We discovered the facts from the fiction. *Penny Black stamps were really the world's first adhesive stamp used by Great Britain. *A jack snipe is a migratory bird found in Europe. *Young Queen Victoria's story was true. *No orange stamps created from the Penny Blacks. *Bradley had never been to England despite his England-born mother. So the setting of the Buckshaw estate in the sleepy village of Bishop's Lacy was purely fictitious. "I detected instantly that she didn't like me. it's a fact of life that a girl can telling a flash if another girl likes her. Feely says that there is a broken telephone connection between men and women, and we can never know which of us rang off. With a boy you never know whether he's smitten or gagging, but with a girl you can tell in the first three seconds. Between girls there is a silent and unending flow of invisible signals, like the high-frequency wireless messages between the shore and the ships at sea, and this secret flow of dots and dashes was signaling that Mary detested me." "Try to be a good girl, Flavia," he said. Try to be a good girl? Was that all he could think of? It was evident that our submarine had surfaced, its occupants hauled up from the vasty deeps and all the magic left below. "I"ll do my best," I said turning away. "I'll do my very best." "I suppose I should have let our a shout, but I didn't. I was nowhere near my wits' end. In fact, I was rather beginning to enjoy myself". "The stamp in your pocket has just doubled in value." "The bit of tinder that had been smoldering away in the back of my mind burst suddenly into flames". and we can't forget "Vale!" and "kick him in the Casanova's and run like blue blazes!" Lisa that was super impressive. Maybe you should do all our blogs about the books. Good Job! Alan Bradley had been to England, just not raised there, I believe.